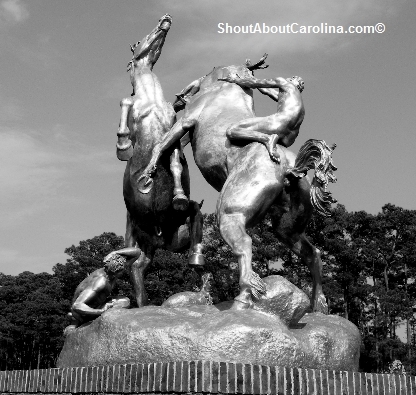 Present day Brookgreen Gardens stands on what was known as The Oaks, Brookgreen, Springfield and Laurel Hill rice plantations, powerful dynasties built on the backs of thousands of African slaves. They provided the labor, skills and technology required for rice cultivation and production and enriched the region with their traditions, crafts, and language known today as the Gullah-Geechee culture. 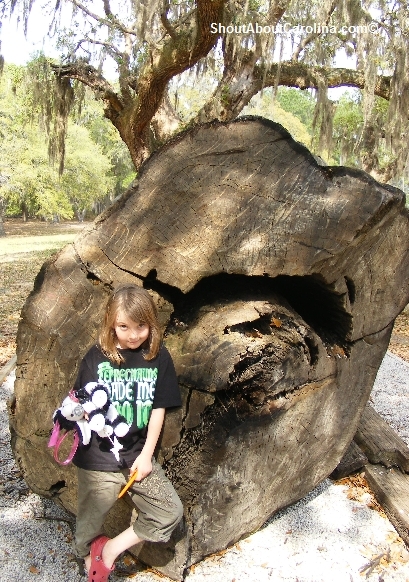 The Lowcountry Trail provides a glimpse of what life was like on the plantation hundreds of years ago. Admission to Brookgreen Gardens is $12.95 adults, $10 seniors and $6 children 4-12 and is valid for 7 consecutive days. You can see the remains of the overseer’s residence (on top of the hill), kitchen, smokehouse and dependency (at the edge of the rice field), uncovered during 2000-2001 archeological digs. As you stroll the boardwalk along the Ricefield Overlook listen to the audio tour, that features a 30-minute fictional story about life on Brookgreen Plantation. Four stainless steel figures, created by award- winning artist Babette Bloch, tell a revealing story about the specific roles of a Lowcountry plantation: the Plantation Owner, the Overseer, the Enslaved African Male and the Enslaved African Female. The overseer’ smokehouse architectural design features an exterior firebox, only the second example of its kind to be located and excavated in the Southeast. During the antebellum period, smoked meat, primarily pork, was a staple food for everyone living in the South. The meat was preserved during the “dry salting” process before it was hung in the smokehouse. Pieces of fresh butchered meat were rubbed with raw salt and placed in a wooden box for up to six weeks. Then the preserved meat was smoked for about a week to give it a particular flavor. Meat was either placed on shelves our hung from horizontal poles. The smokehouse was filled preserved meat, ham and bacon. As the slaves survival and well being were directly linked to the content of the smokehouse, food allotments were often used as means of social control. 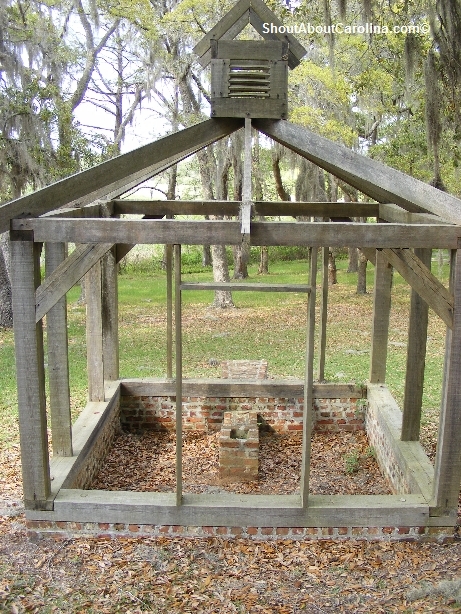 The smokehouse came to symbolize the plantation self-sufficiency and the owner’s control over its workforce. By the end of the 18th century all cooking tasks were relegated outside the main residence, thus avoiding the heat, noise, odors, and fire hazards associated with the kitchen. It was common for kitchens to also serve as laundry and dairy functions. 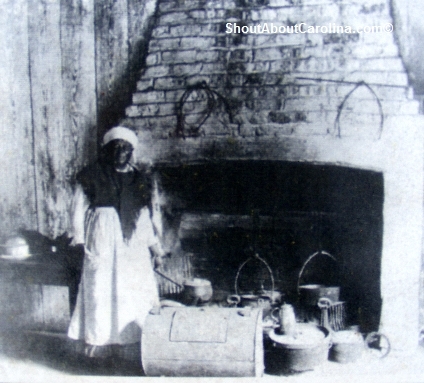 The detached kitchen provided a clear separation between masters and slaves. It was an important symbol of social boundaries with clear definitions of status, position and authority. Archaeological discoveries suggest a typical mid 19th century rural south diet. People consumed cattle, pig, sheep, goat and to some extent chicken and geese. 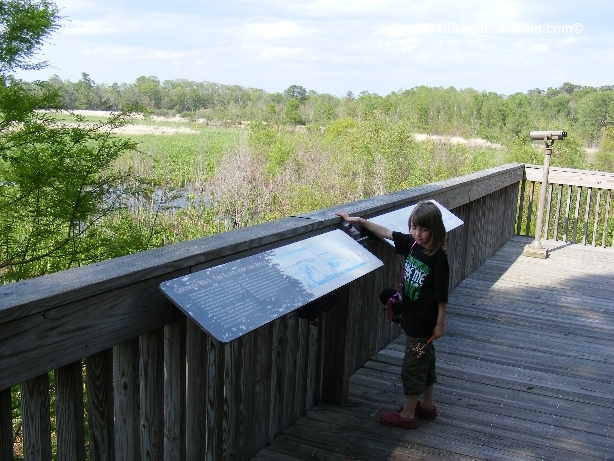 Additional food sources included wildlife from nearby rice fields, creeks and woodlands: gar, perch, striped bass, turtle, wild duck, deer, squirrel and opossum. 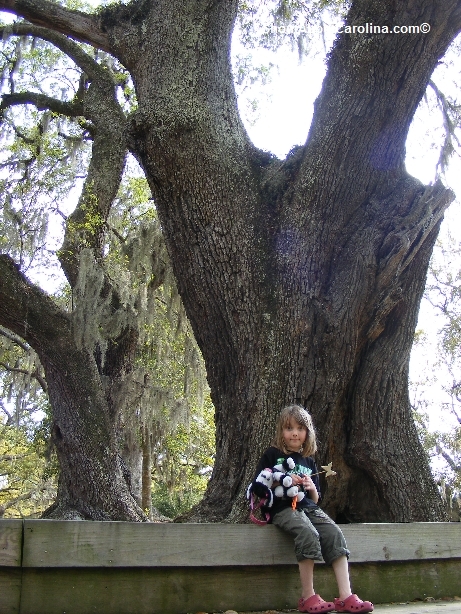 There are many tales surrounding the old Brookgreen Plantation at Waccamaw Neck. My favorites are about Theodosia Burr Alston and the Crab Boy who despite warnings stuck his hand where it didn’t belong, beautifully written by Lynn Michelsohn in her book, “Tales from Brookgreen: Gardens, Folklore, Ghost Stories, and Gullah Folktales in the South Carolina Lowcountry”. All quotes are from this book. At the turn of the 19th century, The Oaks-Brookgreen Plantation welcomed a new Mistress in Theodosia Burr Alston, the only child of Vice President Aaron Burr. She married South Carolina Governor Joseph Alston and gave up the high social life in New York for a life on the rice plantation. Fortunately, little Aaron was born in 1802 and the next ten years brought joy and happiness to his parents. However, in the summer of 1812, the boy died from sickness and was buried in the family plot on the plantation. Devastated, Theodosia planned to visit her father in New York to try lift her spirits. She departed Georgetown harbor for a six days sea voyage on a small schooner, The Patriot. The vessel never reached New York. Theodosia’s mysterious disappearance gave way to countless speculations and remains a mystery to this day. Over years many have sighted her spirit either near the Georgetown warehouse where she boarded the vessel or walking the shores of Dubordieu Beach where her son died. Some have seen “floating over the waves on foggy nights at Huntington Beach, once called Theaville in her honor” or walking down the steps leading to the rice island at Brookgreen Gardens.